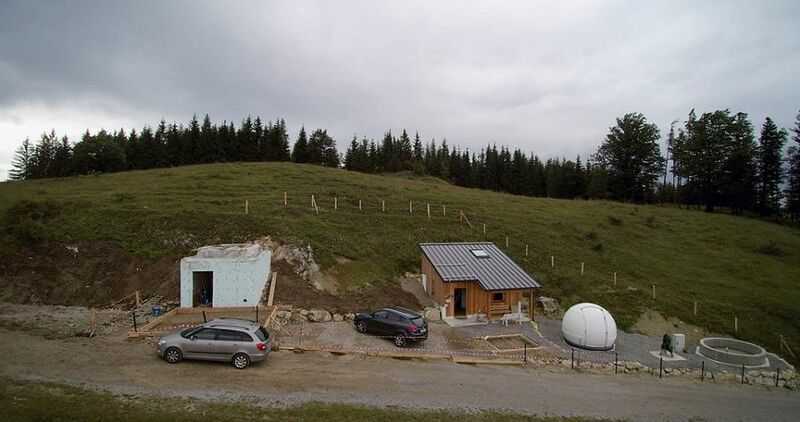 Kepler Remote – Page 4 – The story of installing a remote observatory in the foothills of the Alps. Each telescope needs a mount. In our case, this is a self-built equatorial fork mount. It is called “Österreich Neu” or ÖPFM, and was developed by Rudolf Pressberger. He also developed the telescope housing which is an integral part of the complete mount. This makes the mount very stable and effective. The downside is, you can’t use other telescopes with it. Only a few of these mounts are produced till this date, and the LAG owns two of them: the public telescope in Linz located at the Johannes Kepler Observatory and now the KRO telescope. The KRO telescope on its old location (Observatory Davidschlag) shortly after mobilization in 1999. The Photo shows (from left to right) one of the owners, Erich Meyer, the developer of the mount/telescope, Rudolf Pressberger and the second owner Erwin Obermaier. The telescope (50cm f/10 Cassegrain telescope) at the Johannes Kepler Observatory in Linz during a public viewing. (Photo by Herbert Raab). What is now so special regarding this mount? Basically it was designed to be built by one self – surly with some skill in welding and general metal works – and for precision. Pressberger developed two versions, one more conventional one, with worm gear drive and rolling contact bearing and one refined version with friction wheel drive and special Teflon ball joint bearings. The second version is the one we use for the KRO and the Johannes Kepler Observatory. The special ball joint bearings are superior in terms of friction compared to really high quality pendulum rolling contact bearings. A nice side effect is, that you can easily make them by yourself. There is no conventional RA axis, with its usual big and expansive rolling contact bearings, attached to the fork. The big friction wheel itself will become a part of the bearing. Therefore, you do not have the usual eight-part cantilever strain of the RA axis. The weight distribution of the mount and tube is optimized for low vibration. Friction wheels are generally not so easy to handle, but in combination with the special bearings mentioned above, they can be used successfully. The necessary contact pressure of the drive shaft on the friction wheel is applied in RA of the weight of the fork and the tube. Thus, the remaining cantilever load of the hour axis is used meaningfully. The 50cm telescope of the Johannes Kepler Observatory during construction (around 2000). It is similar in construction to the KRO telescope. Only the fork width and mirror cell are a little bit bigger in the KRO since its main mirror is also bigger. The main disadvantage of the mount are its, “virtual” axis. Due to the special construction of the bearings with ball joints, you do not have to use right angled axes (in relation to the fork and tube), but instead you can use angled (thus “virtual”) axes. Unfortunately this makes an update we have planned for the KRO more complex and more expansive: adding absolute encoders. We can’t use encoders you simply connect to the rotating axes, thus we do not have such. We have to use quite big ring encoders mounted directly on the RA friction wheel and the tube (DEC). We will discuss the usage of encoders on the future in a separate post. So one can ask now, why the heck to use such unusual axes? For the DEC axis it is mainly to provide an easy adjusting mechanism to adjust the orthogonality error. And for RA axis (which is also hold by a ball joint bearing) it was mainly done to overcome the big and expansive rolling contact bearings. Due to the special bearing construction, the friction wheel itself becomes part of the bearing, and minimizes, for fork mounts typical cantilever load, to nearly zero. Another advantage of the ball joints (for RA and DEC axes) developed by Pressberger, are the materials they are built from. The balls are hard chrome plated steel balls, sitting in a Teflon bearing cup. This type of bearing looks like an artificial hip joint. The pair of materials (hard chrome plated steel balls, Teflon) make up a really tight fit, since the Teflon, at high bearing pressure, bends around the ball (due to the flexibility of Teflon) and reduces the friction to a minimum. The ball more or less, swims on the Teflon. And there is another advantage: the initial breakaway torque, which is quite a problem for friction wheel drives (slip), will be reduced to zero. The pole block shows, that the mount is clearly designed for stationary usage. Not only due to the weight of the whole thing, but also due to the static angle of the pole block. The angle of the pole block should be 90° – geographic latitude and is welded in this way. But there is the possibility to adjust the mount with four push/pull screws in the pole block. So the mount/telescope can be oriented exactly to north and geographic latitude. During inspection and testing at Davidschlag, we noticed that the friction wheels are corroded on their bearing surface. The surface there is quite the same as the ball joints: hard chromed plated. Removing the chrome from the steel wheel is quite difficult (turning it down) and will result in a smaller friction wheel which will not fit anymore. So we decided to rebuild the two friction wheels (RA and DEC axes) completely and scrap the old ones. The positive side effect: we can also turn the required encoder mountings directly on the new friction wheels. But all in all, the mount and the telescope are in quite a good shape. After finalizing the last tests in Davidschlag, we will dismantle the whole thing. We will report in a future post about this major project milestone. The Telescope we got for this project, also came with a high sensitive CCD camera. Namely a SBIG STL-1001E. This camera makes use of the Kodak enhanced KAF-1001E CCD chip with 1024×1024 pixel. The pixel size itself is huge: 24µm x 24µm, and therefore the camera is extremely light sensitive. The chip size is 24.5mm x 24.5mm, the detector type is full-frame. There is also a separate guide image sensor inside the camera, although it will not be used within the KRO project (we plan to use a separate guide scope + high sensitive guide cam connected to PHD2 guiding software). The camera is also equipped with an active two staged Peltier cooling system, which also supports liquid cooling to reach even lower temperatures. With the air cooling alone, we can reach -40°C easily. The usage of the liquid cooling system is not planned for KRO so far, but we can switch easily to it in the future if needed. The image download is done via an USB 1.1 connection. This is fast enough since the images are rather small (1024x1024x16bit) and the chip read out works also quite slow to prevent heating up the read out amplifier and introducing read out noise. Internally in the camera we have a 5-slot filter wheel, where we are currently have RGB-filters, one clear-filter and one 12nm h-Alpha filter. The filter wheel is controlled via the same USB interface and also works with our imaging software Astroart. In our current telescope configuration (1980mm focal length, 600mm aperture, prime focus) we can cover an area of about 0.71° x 0.71° with 2.49″ per pixel resolution. The best observed seeing on our future observatory site was <0.5″. So the camera do not make use of the best observation conditions, but for now it serves our needs. In the previous post we talked about the search for the dome and its technical spec. Now we got the dome delivered and started with the construction of. We ordered the dome without professional construction and setup, since we’d like to do this on our own. The first major problem we encountered, was the delivery to the observatory site. 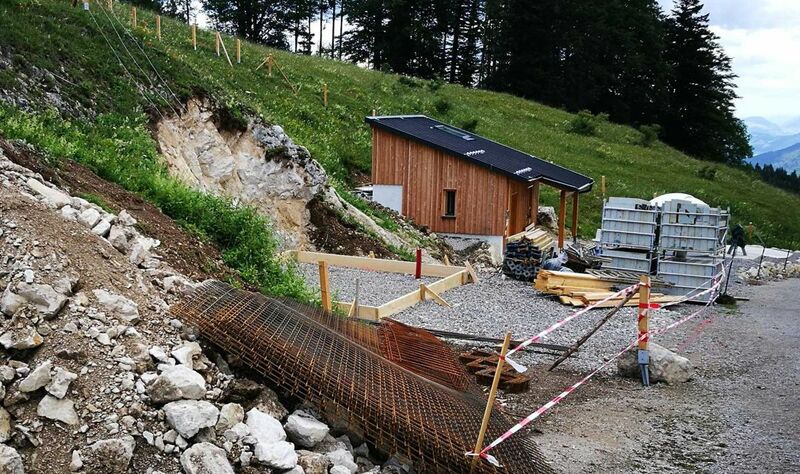 As mentioned in “A project begins – And who drives it” the site is quite remote in the alps, and therefore we do not have a highway up to the front door of the observatory 😉 … it is more like a very steep and winding farm track, only used by the local farmers with their tractors. So the delivery vehicle made it to the first hairpin bend and got stuck! Fortunately, the local farmer helped us out and towed the delivery truck and its trailer with his tractor up to the observatory. The farmer also helped us with his tractor to unload the delivery, since the parts were quite huge (4m x 2.5m, barley road legal). 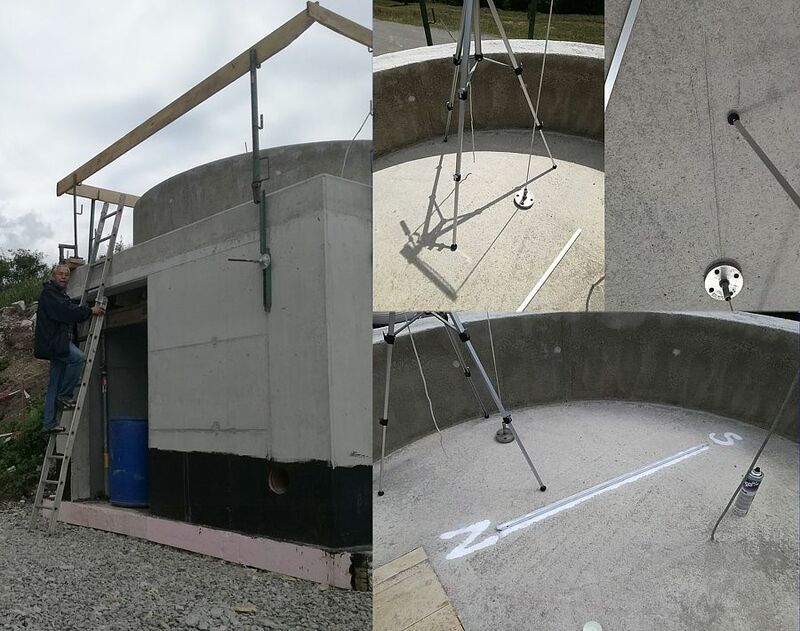 On the next day, with quite bad weather, we started to mount the dome drive ring to the concrete dome base. This was quite a tricky installation, since the parts have to fit together perfectly, and they also have to be adjusted perfectly to guarantee a smooth dome turn afterwards. So we need to adjust some parts. The base ring construction did take some days – it was the most complicated part in dome construction. As the dome base ring, with its lower stationary part, and the upper rotating part was completed (see image below), we started with the actual dome construction. Since the individual parts are 8mm fiberglass, they were quite heavy, and we needed a lot of man power to move them around. To make us the life easier, we decided to build the dome on the concrete place in front of the observatory, and then lift it up and bolt it to the base ring. The dome will become really stable only after it is finished, and so it was a challenge to hold the parts in place until they are bolted together. Luckily we had a lot helpers and so we managed to build the dome in one single day! This was also necessary, because we had ordered the crane for the next day to lift the dome to its end position on the observatory. 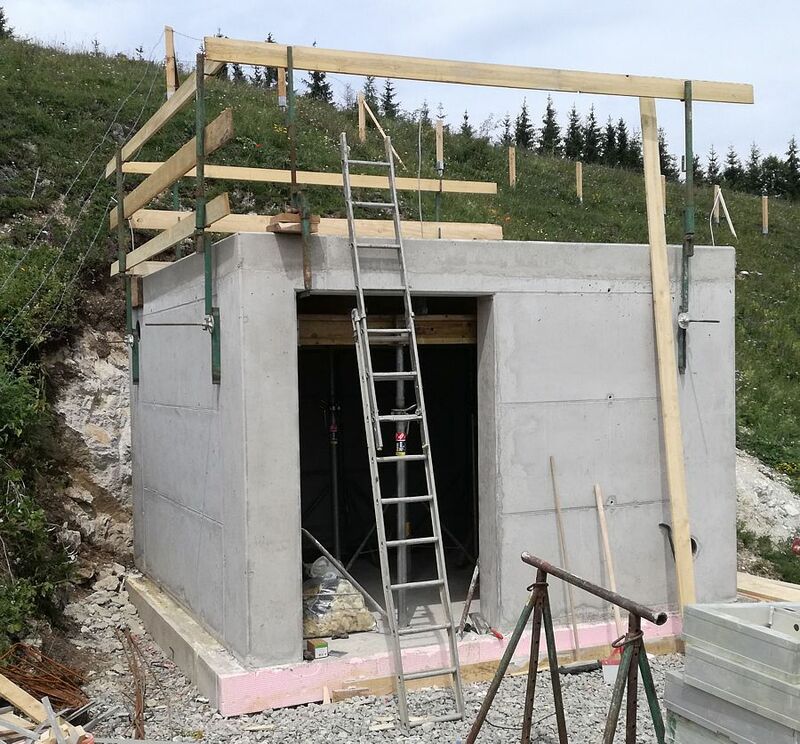 The observatory got its dome on 18.08.2018 and was now so far built to start with the interior fittings. On the same day, we also did our first dry run, and hooked up the dome to a powerline, installed its electronics and fired it up: it moves quite well and smooth! So the dome is ready for operation. There is still a lot of work to do, so stay tuned for more! It is now quite some time ago, since we posted our last update on the Kepler Remote project. But we weren’t deedless in the meantime. We manged to build an almost finished observatory which will become the home of KRO telescope. 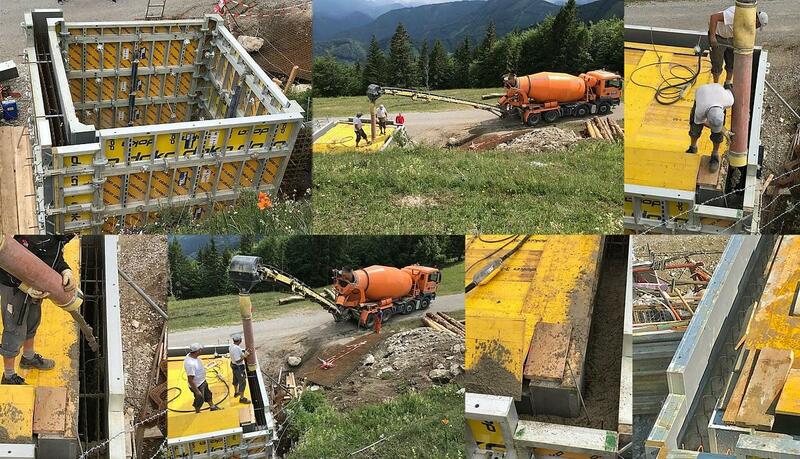 As mentioned in the previous post A project begins – And who drives it we found a really good spot, and started to build an infrastructure there in cooperation with the “Sternfreunde Steyr”. 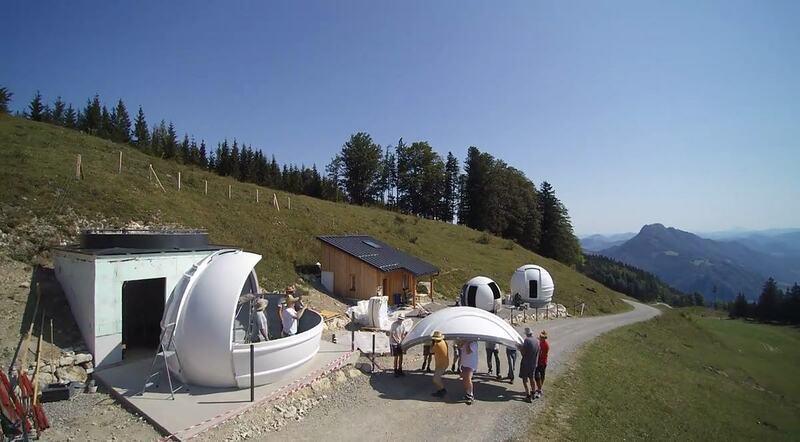 The Sternfreunde Steyr, already built a hut and a dome last year. As the spot for the KRO was now defined, we started with the excavation. 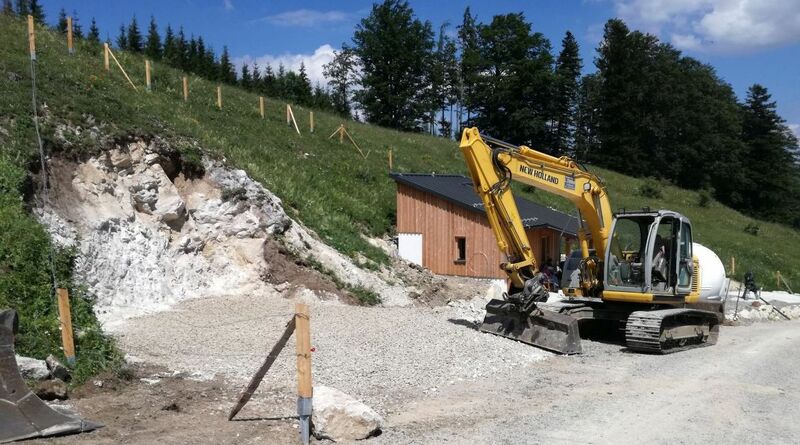 Digging into the soil was easier than first thought, and therefore the actual construction of the observatory building could begin. The maintenance room/Sever room which houses the telescope electronics and provides some storage space too (ground floor). The dome with the instrument itself (first floor). The building is built entirely of concrete, since it also functions as the base for the telescope itself. The KRO is a remote observatory and therefore we do not need separated bases (during operation nobody should be in the building) for the building and the telescope, but the building had to be quite strong. The building is now more or less finished, and just waits for the arrival of the dome. The dome construction, placement on the observatory building and dome description will be discussed in “Tech – The Dome”.